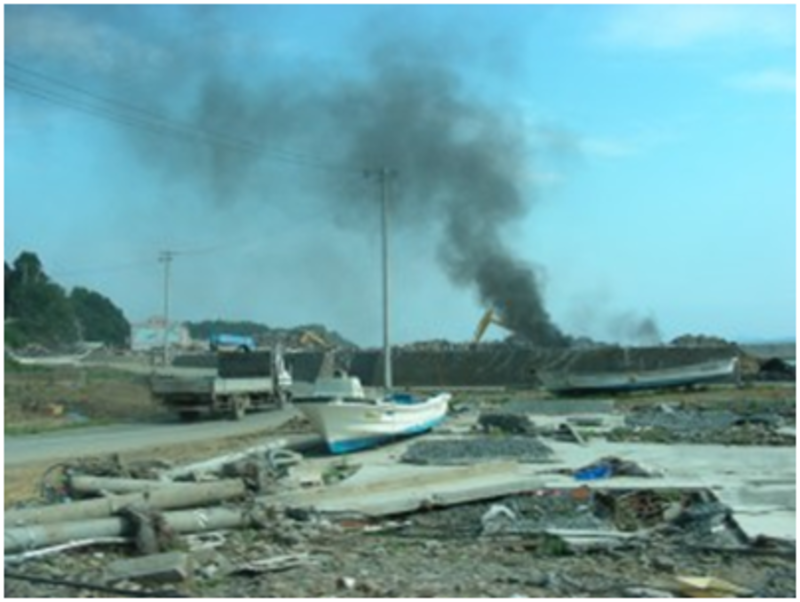 This article provides observations from the consumer perspective on food safety in the wake of the Great East Japan earthquake tsunami and nuclear disaster of March 11, 2011. The human and environmental effects of the extraordinary catastrophe on March 11, 2011 in northeastern Japan are difficult to assess even as four months have passed since the 9.0 earthquake and tsunami. This is in part because the crisis at the Fukushima Daiichi Nuclear Plant is ongoing, with radiation leaking from at least four reactors requiring evacuation of areas in Fukushima prefecture and beyond, and restrictions on food grown and produced in certain areas. It is a humanitarian disaster that affects all citizens in the Tohoku region, but specifically its farmers, fishermen and food producers; for consumers, it also poses specific challenges that need to be addressed based on what we know so far. This paper will deal with general food safety issues in the wake of the crisis. What can be concluded about the general level of safety or risk, looking at it from the perspective of consumers? Countries may and do set national standards that are higher or lower than the Codex standards, depending on specific intake variations of local food and cultural preferences. After Chernobyl, the main European concern was with grazing cattle, sheep, and reindeer. In Japan, by contrast, people consume large quantities of rice, vegetables and fish. Thus, the country may decide to set more strict safe levels for such foods, as total exposure will be higher than in a country with other dietary traditions and preferences. Japan had no guidance levels or restrictions for nuclear substances on food at the time of the nuclear disaster. It raced to draw up provisional regulation values by March 172 and legislation by March 29, 2011. The main isotopes being measured in Japan are radioactive Iodine and Caesium, but other substances like Plutonium and Strontium are also relevant and should be measured carefully. It is unclear which radioactive isotopes were tested for or detected in the early days of the crisis. The method of sampling at the local level is still sometimes unclear and needs to be further investigated by independent experts to increase consumer trust in the process. The initial data published by the government showed extraordinarily high levels of Iodine-131 on vegetables such as broccoli, spinach, parsley and celery in many locations in several prefectures, especially in Fukushima5, but also in Ibaraki6 and Chiba7. Raw milk was tested and found to have slightly elevated levels in all parts of Fukushima with levels above the safe levels in certain areas8, 9 and slightly elevated levels in Saitama and Gunma,10 but not nearly as high as in Fukushima. Note that such food products are not for sale. In all the cases where detected levels were found to be higher than the government’s provisional regulation values, the foods have been prohibited from being placed on the market. Hence, no milk from the places where high levels were measured is allowed to be sold four months after the crisis. This does not mean that all food products with high levels have been kept away from consumers; some was shipped before testing was initiated, or from areas in which contamination was not initially recognized. The possibility remains that vegetables or milk from areas that have not yet been tested were put on sale. That does not mean that the public has been exposed to unsafe amounts of contamination, as the exposure would appear to be for a short time only, especially in the case of spinach or broccoli harvested in mid-March in the most heavily contaminated areas in Fukushima prefecture. Caesium isotopes have a long half-life, 2 years for Caesium-134 and 30 years for Caesium-137. It is thought that the two isotopes have been released in approximately equal proportions. This will have consequences for rice production, and the rice harvest later in 2011 should be carefully monitored. It is worth noting that levels of radioactive Iodine have mostly decreased to levels that cannot be detected, which is consistent with expectations, as its half-life is 8 days. The Japanese government ordered so-called mercy killing of cattle inside the evacuation zone up to 20 km radius from the Fukushima Daichi Nuclear Plant, but only on a voluntary basis. In Europe, the culling of grazing animals such as reindeer was made mandatory after the Chernobyl disaster. In Sweden, for example, over 70,000 reindeer were killed after testing revealed elevated levels of Caesium in the meat. It is obvious that livestock in Fukushima must be monitored much more closely than first thought, and wild game from the region is very likely contaminated to a large extent. Although we now know which areas that need special attention, four months after March 11, there is great concern that Japan’s government has not acted rapidly enough to protect consumers. Meanwhile, some desperate food producers, who take short-cuts in order to sell their produce quickly to avoid loss of their crops or livestock are undermining the efforts of others. Regarding fish and seafood, large amounts of radioactive substances have been released into the Pacific Ocean. This contamination is observed in the measurements done on fish and seafood along Japan’s Pacific Ocean coast. Three to four months after the initial release, and most likely also due to continued release in the course of these months, low levels of both Caesium-134 and Caesium-137 have been found in a large number of samples, ranging from salmon in Hokkaido,16 mackerel in Chiba prefecture,17 and other types of fish and seafood products in Iwate, Miyagi and Fukushima prefectures.18 In most cases where sampling has been undertaken, however, no radioactive substances have been detected, or the levels are well below than the government standards. The Shizuoka Prefectural Government called for shipment restraint and voluntary recall of the concerned tea sources. However, according to research conducted by Shizuoka Tea Research Center, “when brewed for drinking, the radioactive cesium level significantly drops (1/85) and therefore does not present any negative health influence.” It is unclear how Caesium-134 and Caesium-137 have accumulated on or in tea leaves, and why it took so long for tests to reveal the contamination. It is also important that tests be done on tea for other radioactive nuclides. Simply put, the data as presented on the government’s website would not stand up to peer review for an academic paper. We desperately need detailed studies, however, these should be done by experts with a background in food safety science and consumer protection. Consumers are still left wondering if testing has been done on the foods that are actually in shops or supermarkets, or if testing is limited to the production stage. Unsystematic sampling methodology means we do not have a clear grasp of how the levels of radioactive contamination have decreased, for example in the case of Iodine, with its 8-day half-life, on products such as broccoli and spinach. Consequently, and for many other reasons related to the mishandling of the nuclear crisis since March 11, some consumers feel that they cannot rely on the official data. Other pollution in addition to radioactive nuclides is entering the food chain in the wake of the earthquake tsunami, posing completely different risks to consumers. Chemical factories, oil refineries, and other petrochemical industrial complexes were destroyed or seriously damaged along the entire 400 km coast of Tohoku from Iwate and Miyagi to Fukushima, Ibaraki and Chiba. The large number of fires immediately after the earthquake and tsunami as well as indiscriminate burning of debris and garbage will have health effects that are very difficult to estimate. Data is not yet available from systematic testing of the substances such as asbestos or dioxins that were released into the air and water after March 11, 2011. Indeed, testing of air quality, public water areas, groundwater, soil, seafloor, and tsunami sediment is still in the planning stages. We can only express our deepest sympathies to everyone involved in the rebuilding of the Tohoku region. It is important to note that vegetables or other foods that are being measured outside of the most contaminated region in Fukushima prefecture show very low levels or do not show any detectable levels of radioactive substances three to four months after the nuclear disaster at Fukushima Daiichi Nuclear Plant. In most parts of the Tohoku region in northeastern Japan, there is zero or almost no detectable nuclear contamination. In the rest of Japan, consumers can rest assured that there is no radioactive material on their dinner tables. Based on the official data as published by Japan’s Ministry of Health, it emerges that three to four months after March 11, with the exception of food from certain areas in Fukushima prefecture (and possibly tea that was grown outdoors on tea shrubs since March), Japan’s farmed food supply and its products can be generally regarded as safe. Japan has 1.9 million farms producing food from Hokkaido in the north to Okinawa in the south, and will by all accounts continue to make every effort to feed its population with domestic vegetables, fruit, grains, and so on. Thinking ahead, the issue of soil contamination and accumulation needs to be addressed and carefully monitored, as it will affect rice production, especially in parts of Fukushima prefecture. Pollution problems such as asbestos, dioxin and PCB, due to post-March 11 fires and indiscriminate burning of debris and garbage, will add to the health risk. There are also worries about small or large radioactive hotspots in areas with higher levels of contamination from the Fukushima Daiichi Nuclear Plant. More precise maps of the contamination must be prepared by reliable methods. Much needs to be done to limit long-term contamination and protect consumers in addition to generally help regain the trust and confidence in Japanese food. Producers also require support. Farmers, fishermen and food producers need to be compensated and areas devastated by earthquake, tsunami and meltdown need to be restored with due attention to radiation risk. The stakes for Japan in doing so are high. This is an updated and expanded version of a paper written for Consumers Union of Japan. Martin J. Frid was born in Sweden and works for Consumers Union of Japan. He is the author of the food guide book Nippon no Shoku no Anzen 555 (Kodansha) published in 2009. He has participated in food safety meetings on the local, national, and international levels, including as an expert at FAO/WHO Codex Alimentarius Commission meetings. He currently resides in Saitama, Japan. 1 FAO: Fact Sheet on Codex Guideline Levels for Radionuclides in Foods Contaminated Following a Nuclear or Radiological Emergency-Prepared by Codex Secretariat (May 2, 2011), link. 3 FSCJ: Radioactive Contamination of Food in Japan (Accessed July 8, 2011), link. 4 See for example the table of Radiation exposure limits for food, based on MAFF data, in The Japan Times (June 26, 2011), link. 5 MHLW (March 22, 2011), link. 6 MHLW (March 19, 2011), link. 7 MHLW (March 22, 2011), link. 8 MHLW (March 20, 2011), link. 9 MHLW (March 21, 2011), link. 10 MHLW (March 23, 2011), link. 11 The Japan Times: Irradiated food poses moral dilemmas (June 26, 2011), link. 12 Daichi wo Mamoru Kai: いま、私たちができること。大地を守る会の震災復興支援 (March 23, 2011, in Japanese, accessed July 8, 2011), link. 13 The Japan Times: State to buy all radioactive beef (July 22, 2011), link. 14 NHK World: Radiation detected in beef from Fukushima (July 9, 2011), link. 15 For a detailed analysis of media reports about the beef issue, please see Asia-Pacific Journal Feature: Japan’s Irradiated Beef Scandal (July 25, 2011). 16 MHLW (June 24, 2011), link. 17 MHLW (June 25, 2011), link. 18 MAFF (July 5, 2011), link. 19 MAFF (June 23, 2011), link. 20 MHLW (June 29, 2011), link. 21 MHLW (July 1, 2011), link. 22 Shizuoka Prefecture: Test Results for Radioactivity on Tea Produced in Shizuoka Prefecture (June 30, 2011), link. 23 Bloomberg: Food safety fears grow in Japan on skepticism at radiation testing regime (June 16, 2011), link. 24 ATMC.jp (In Japanese, accessed July 8, 2011. This website has an option of translating the pages into various languages. ), link. 25 CRIIRAD: Note No11-47 E C3 (Accessed July 8, 2011), link. 26 CRIIRAD: Consequences of the Fukushima Daiichi Accident in Japan: A substantial and long-lasting contamination (July 7, 2011). The results of the soil sampling must be further analyzed to avoid farming in areas with high levels of radioactive contamination. 27 Bird WA, Grossman E, 2011 Chemical Aftermath: Contamination and Cleanup Following the Tohoku Earthquake and Tsunami. Environ Health Perspect 119(7). (July 1, 2011), link. 28 Agweek: Japanese farmers affected by tsunami hopeful for swift recovery (April 5, 2011), link. 29 MAFF: The Damages caused by the Great East Japan Earthquake and Actions taken by Ministry of Agriculture, Forestry and Fisheries (July 6, 2011), link.